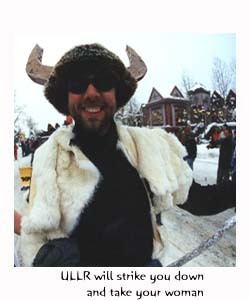 We're a long ways away from the good ole' days, when the locals turned Main Street into a raging keg party and hurled old skis into a great conflagration to honor the snow god Ullr. But if you look hard enough, in just the right places, the wild spirit that has infected Breckenridge since the earliest days of recorded history lives on. It may be barely breathing, but as Free Press photographer Matt Krane found, it definitely still has a pulse. "It's much harder to find the Ullr spirit today," Krane says. "But it's still here. It's found in the number of flasks and the number of women who were baring their chests." It's found in the drum circles and dancing band of gypsies, and the brave souls who expose their skin to freezing temps and ride kegs like bucking broncos down Main Street. "This year's parade was fairly colorful for a cold, grey day, but there were very few people going out on a limb," Krane reports. He suspects that may have something to do with a fear factor brought on by "new members of the law enforcement community," as well as a general apathy among locals. "We've become homogenized," Krane says. Biff America - who has emceed the Ullr Parade "since the days before the invention of the internal combustible engine, when all the floats were horse drawn" - was disappointed in the paltry showing of creative floats in this year's parade (which he suspects may be due to the poor locals being too tired after all that powder skiing). America has noticed a cyclical pattern in the Ullr spirit. "Sometimes the parade harkens back to the old days, with a lot of satire, good editorializing and bad taste," he says. In other years, "it's a homogenized collection of Realtors and politicians." Creative floats of yesteryear that he fondly remembers include "Sister Mary Martha straddling a scud missile" and a float named "Raging Queen," which was an eclectic collection of All-American icons - such as Tonto, Marilyn Monroe and the Statue of Liberty - dressed in drag. Krane says he hasn't seen an exceptional float in the parade since the late 1980s, when the Ridge Street Rowdies put together a Ted Bundy memorial float. "It was a puke green Pontiac Boniville with a guy in a rocking chair on the roof strapped down with a metal salad bowl with wires coming out strapped to his head," Krane recalls. One side of the float read, "Give me sorority girls or give me death," while the other said "Aspen can't hold me" (because Bundy once escaped from the Pitkin County jail). "It was the quintessential statement of the 1980s," Krane says. "I as of yet have not see a quintessential statement of the 1990s." The closest thing, Krane says when pressed on the issue, is the Agnostic Church of Breckenridge. Church floats have included the "Crucifixion of Ullr," featuring a bare chested Ullr nailed to a cross; "Celebrity Tree Skiing," with Sony Bono and Michael Kennedy wrapped around a tree; and last year's "Two Elks Burn Baby Burn." "I myself am an existential agnostic," Krane says. "We believe in a higher intelligence in the universe, with the exception of New Jersey."